Monday last week at the SMC, Sean Baxter from Behind Bars walked us through a very tasty line-up of some beautiful Single Malt whiskies produced in different regions of Scotland to give us an idea of the different styles. In the line up we had a total of 6 whiskies - Glenkinchie 10 and 12 year old from the Lowlands, Talisker Distillers Edition and Talisker 18 Year Old from the Islands and Lagavulin 12 and 16 Year Old from the Islay. Proceeding in order, we started our comparison with the Glenkinchie 10 and 12 comparing the subtle but noticeable changes in colour, aroma and flavour that the extra maturation had imparted on the 12 year old. When tasting side by side the Talisker 18 and the Distillers Edition we discovered the effects that different type of ageing can bring out in whiskies, for instance longer ageing does not always equal to darker colour. The Distillers Edition is finished in Jerez Amoroso Sherry casks and has a deeper and darker colour than the 18 year old. This type of finishing also brings out a variety of fruity characteristics. The last whiskies of the night were the Lagavulin 12 and 16 year old from the Islay, the differences being quite noticeable between the two brothers; the 12 year old has more medicinal qualities and the 16 year old is more complex and peaty. To intensify the tasting experience, a piece of black peat was lit up that quickly filled up the bar with beautifully warm and relaxing aromas. Actually, I quite started missing the peat saunas we sometimes treat ourselves to back home in Finland. I really enjoyed this SMC session on Monday night, and it even got a bit geeky when Sean explained how even the shape of the still can affect the flavours we perceive in our whiskies. 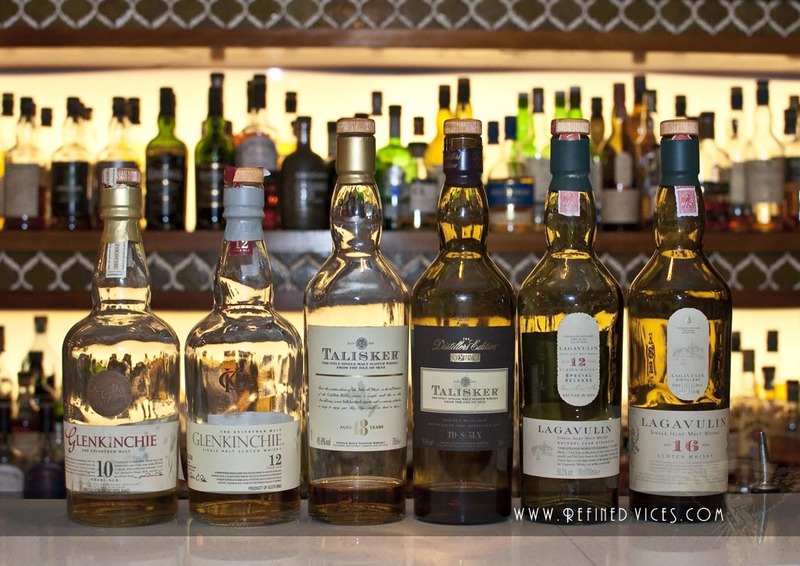 Keep an eye out for future SMC gatherings at Refined Vices and Chez Regine and remember to RSVP quick as they are announced as there are limited seats to these tastings. More photos of the event can be found on facebook!